Hi all, I was not very happy with the look of my previous posts which I prepared off-line then emailed to the blog when I got an internet connection and had to go back in when I could get properly online to add photos not very successfully like last time. So as we have good Wi-Fi connection where we are now I have searched to find what others do and found some new Blogging Software which allows me to work offline just the same but insert pictures and format the post properly. It also uses the Microsoft spell checker so hopefully I won’t get the typos so much. But it does have to be done on the laptop rather than the iPod so not quite so convenient.Hopefully it will post this blog properly, let me know if it seems better. Well, what a night! Thunder lightening and rain by the bucket load. It really sounded like a thousand seagulls doing a tap dance on the roof. We really felt for the couple in a little pop-up VW van next to us and even more four the youngsters in tents at the other end of the site. After a fitful nights sleep, at least for Judy (Steve could sleep through a battle!) we awoke to a fine morning. The site owner had suggested we catch the bus to visit Kotor but we decided to drive and take a chance on being able to park so that we could move along in the country. Montenegro uses the Euro and luckily we just had enough left after paying for our boat trip in Euros at the last site, as he needed cash to pay the boat man for us rather than a credit card which we used for the camping charge because we were getting low on Croatian Kuna. 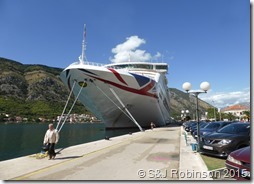 Well we arrived in Kotor and parking looked a nightmare on the approach road. 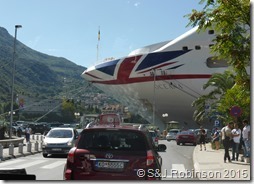 Then suddenly we saw the enormous streamlined bow of a cruise liner which appeared to be right across the road. In fact the road bent round to the left leaving the liner parallel to the road but very very close. We carried on through the town with the Old City walls on our left then found a large parking area outside the cemetery which was ideal and a lot less likely to get the van bumped and free so time wasn’t an issue ok about three quarters of a mile walk but good exercise for us. While walking back to the town we could plainly see a mini Wall of China snaking up the very nearly vertical mountain. I wouldn’t have thought that they had any fear of attack from that side but there was a fort at the top so perhaps it was needed in medieval times. There was also on the other side a walkway along the wall, right up to the fort, perhaps with a wonderful view but we left that to the people from the cruse. The Old Fortified Town was nice but very many people and tours. But we had a walk around and found a cash machine to get some more Euros and a mini market for some shopping..
From Kotor we worked our way along the beautiful coast road clinging to the edge of the cliff the same as in Croatia. 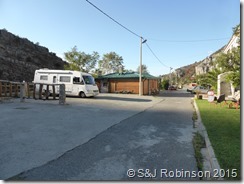 We were heading for Podgorica where our database showed there was camping of some kind, sites in Montenegro did seem few and far between. 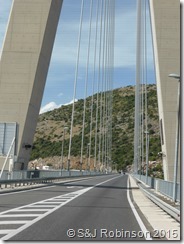 We had the choice of the new toll tunnel under the mountains or the the old road over the mountains. Steve decided on the old road which was spectacular, quite a climb and hundreds of wiggles but beautiful scenery. We were very glad of our special magnetic braking system on the very steep descents, without it the brakes would have been very hot indeed. 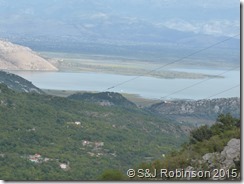 As we drove over the top of the mountain the view of the enormous Skadar Lake half of which is in Albania and the Skadar national park .was breath-taking. The road was quite bumpy so well done to Judy for getting pictures as good as she did at the same time as hanging on for dear life. At the bottom we actually drove across a long bridge across the lake. 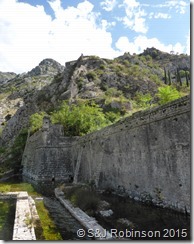 then onwards to Podgorica and our stop for the night. Which was outside a truckers hotel, Fairly basic but it had electric and showers and toilets although we didn’t check those as we don’t need them. We left Hostel Izvor at 09:00 a quiet night once the nearby railway had stopped for the night at about 10pm. The temperature was a bit lower that we had become used to. 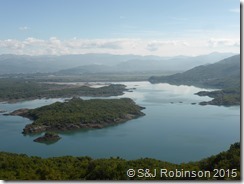 We decided to head back towards Dubrovnik by heading north west via Niksic so we could see a bit more of the Montenegro countryside which also would mean a good stretch of Bosnia rather than the few kilometre corridor we had passed through heading south to Dubrovnik. That little corridor is a bit strange, most Brits going through it have to take a chance driving without insurance as the UK insurers will not cover Bosnia, we hear that occasionally the Bosnian Police will pull a tourist over but most of the time turn a blind eye. Passing through Podgorica we saw an amazing shopping centre with all the top names including M&S but it didn’t open till 10:00 so we drove on, shame because it would have been interesting to see but we had quite a bit of driving including four customs stops. The road we took was fairly ordinary but with quite a few small factories indicating quite a bit of employment, probably the most we had seen. 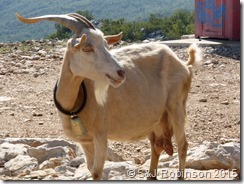 After we passed Niksic the road climbed with great views across a valley to a large lake, there was a panoramic view point so we pulled over to take a photo and were greeted by four very inquisitive goats, with a magnificent leader with a large bell. Steve shook his keys and they all rushed to see what we had for them. Once we got past the goats the view was again breath-taking. 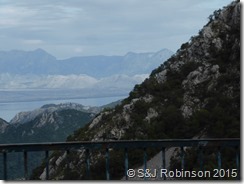 The road descended for a while then climbed again towards the Bosnian boarder. We got our exit stamp in our passports after waiting for a coach driver to clear about 50 passports for his passengers then the Bosnian one and only one gate open and a another coach in front of us. Steve couldn’t raise a smile from this one but again we had to hand over our green card to be checked through the computer. We gained a lot of patience for boarder crossings from our trips to Morocco so just waited our turn patiently. 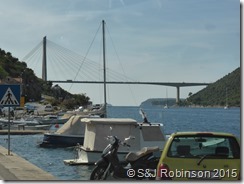 There was again a very twisty decent then levelled out to pass through a fairly large town not even shown on our map then TomTom took us out into the country again to avoid going through Dubrovnik but got a good view of the suspension bridge which cuts off a large detour round the estuary. Moving north we soon turned left off the trusty No8 road towards Stom on the Peljesac peninsular, heading the 58 km to Loviste at the very end. just before Orebic the road climbed up and down the cliffs and became distinctly narrower at some points too narrow for us and the occasional coach heading towards us. At one point we past through an area where there had recently been a very intense forest fire on both sides of the road engulfing most of the mountain. quite poignant for us after the recent forest fires near us. We stopped at a magnificent memorial structure with a view point. It was in memory of those inhabitants lost in the second world war not the recent conflict. We reached Loviste at about 5:45 but couldn’t find the restaurant our friends said they stayed at but there was a very nice looking ACSI recommended site 16Eurper night, so we booked in perhaps to stay for a few days.